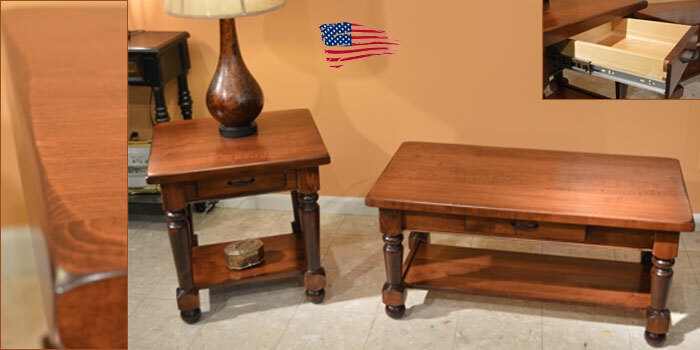 Amish Turned Leg Tables. Shown in solid Brown Maple with unique wire twist hardware. Distinctive turned legs add a traditional elegance along with the scalloped edges and 1.5″ thick tops make this series perfect in any traditional home. One full-extension drawer is standard with each piece. Available in any size, wood specie, stain, and hardware of your choice. Made in USA! Amish Turned Leg Tables features catalyzed finish for an exceptional lifetime durability, plethora of style, finish colors, two tone options available, custom sizes, custom shapes, custom edge detail, and wood specie options in solid (oak, maple, cherry, rustic cherry, tiger oak (quarter sawn white oak), rustic tiger oak, tiger maple, walnut, grey elm, hickory, hard maple).